D-Link’s DWS-3024/3024L L2+ Unified Wired/Wireless Gigabit Switches are optimised for wireless network deployment in business environments. With these devices, businesses can create a high-performance, secure, manageable and scalable unified wired/wireless LAN switching infrastructure. 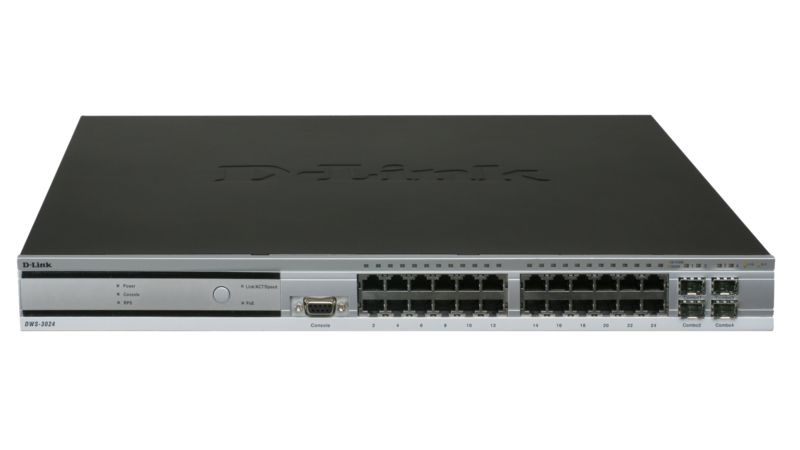 D-Link’s DWS-3024/3024L L2+ Unified Wired/Wireless Gigabit Switches are optimised for wireless network deployment in business environments. With these devices, businesses can create a high-performance, secure, manageable and scalable unified wired/wireless LAN switching infrastructure. Equipped with a combo SFP, Power over Ethernet (PoE), and redundant power supply (RPS) support, these switches provide enterprises with an easy upgrade to next-generation 802.11n wireless LAN, simple deployment of wireless devices regardless of physical locations, and centralised management/policy enforcement of wireless mobility. 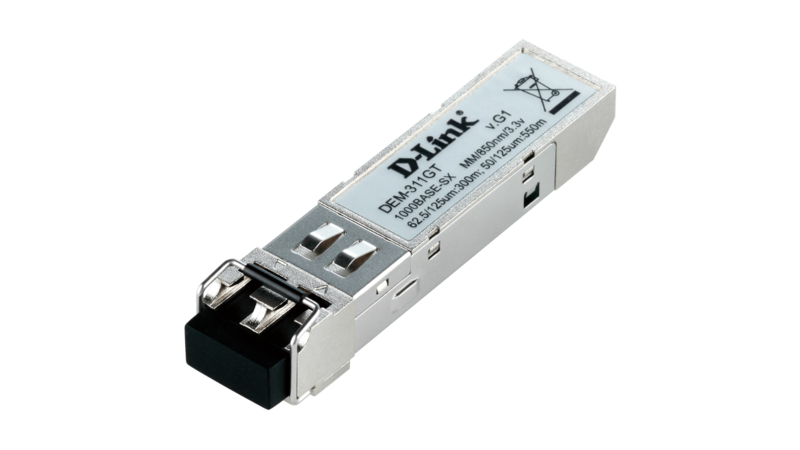 The DWS-3024/3024L switches are the core units that consolidate the security, manage the bandwidth, and maintain the integrity of an entire wireless network. In addition to monitoring users’ identities and maintaining their authentication as they roam, these switches can configure and control all aspects of the wireless access points, including their RF channel/power management, wireless traffic segmentation, AP roaming/AP load balancing, rogue AP detection, and AP access security. Designed for distributed deployments in the wiring closet, each switch can support up to 24 or 48 wireless access points. AP connections can be made directly to the wireless AP switch ports, or indirectly through any LAN switch. With 802.3af PoE integrated into every port, the switch allows for the placement of APs in areas with limited access to AC power sources. Gigabit transmission ensures future compatibility and hardware protects investments when the network is installed with next-generation higher-speed 802.11n wireless standard devices. Each switch has 20 10/100/1000BASE-T Gigabit ports and 4 combo SFP slots. Each of the 10/100/1000BASE-T ports can be connected to a wireless access point, or to a wired LAN device such as a server, a network storage device, or another LAN switch. 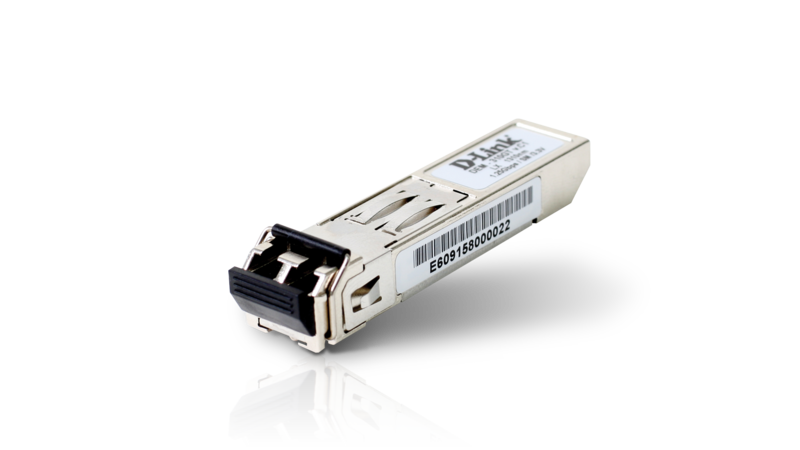 The combo SFP allows for flexible fibre connection. Small to Medium Enterprises (SME) may begin with only one switch to manage their AP or to use for mixed wired/wireless LAN purposes. When the number of APs is augmented, up to 4 switches can be combined to form a large mobility domain. 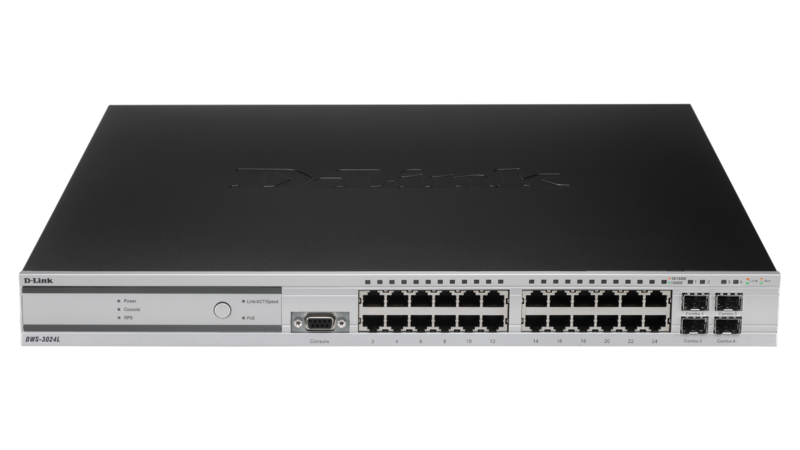 The switch’s many features such as easy expansion, Gigabit speed to support next-generation high-speed APs, and packet routing to support enterprise-wide inter-subnet roaming, lets it providesan architecture that unifies and simplifies an otherwise complex WLAN environment, and readily prepares an existing network for future upgrades. To minimise the need for intervention from IT personnel, the switch provides automatic selection of unoccupied or least-used Radio Frequency (RF) channels for each wireless access point to avoid interference with other AP and RF devices. For each AP, it also sets a transmitter output power strong enough for RF signals to reach wireless clients, yet weak enough to minimise interference with other wireless devices’ RF signals. The switch auto-adjusts the RF channels and transmitter output power of all wireless access points every time an AP is added to or removed from the network. This automatic adjustment can be programmed to take effect at a certain time or at specific intervals, minimising the need for network administrators to manually intervene. The "self healing" process and AP load balancing functions increase the resiliency of a wireless network. To make up for a sudden RF signal vacuum created by any "dead" AP (AP with DC power failure, for example), the switch automatically increases the transmitter output power of all neighboring APs to expand their RF coverage, thereby "healing" the network "wound." To ensure a continuous connection for current clients, the switch performs load balancing across access points when network traffic reaches a certain threshold, while rejecting new client-to-AP associations to avoid bandwidth overcrowding. The process of network maintenance and configuration have been made more efficient through the implementation of a centralised management platform. By running an Internet browser on any PC connected to the network and typing in the IP address of a managed switch, administrators can view the topology map and pinpoint the locations of the AP and the switch itself. The map uses AP icons which administrators can click on to select, and which show different colors to differentiate the different RF channels used by the AP. For quick replacement of a failed AP, administrators can easily locate the AP on the map, swap it with a new one, and apply the same configuration profile to the new unit. The DWS-3024/3024L switches can effectively manage the wireless bandwidth to optimise WLAN traffic using centralised RF policies, auto-selection of the least utilised channels, and AP load balancing. The switch maintains a centralised database of wireless users’ access information such as their MAC addresses and authentication keys. On a network site deployed with multiple peer switches, this information is also shared among the switches themselves. As wireless users roam around the office using wireless equipment, they may change their connection from AP to AP. By constantly monitoring the APs’ status, the switch can establish an AP-to-AP roaming for these users without re-establishing authentication keys. This fast roaming process results in disruption-free, reliable wireless connectivity crucial for mobile applications such as Wi-Fi IP phone and wireless PDA connection. Most of the current wireless LAN controllers’ architecture requires wireless traffic to return to the controller for centralised processing, causing unnecessary traffic delay. 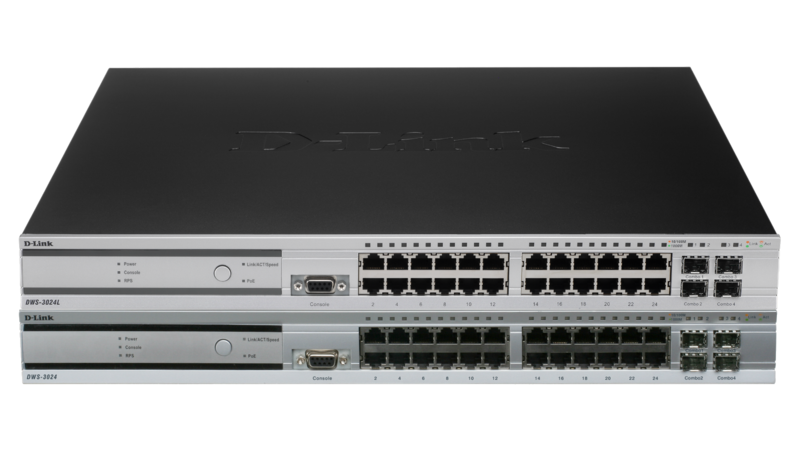 The DWS-3024/3024L switches offer administrators additional options. Depending on the wireless application, wireless traffic can either be tunneled back to the switch for better security control, or locally forwarded at the access point for optimal performance. This device offers administrators maximised flexibility with options to tunnel guest traffic to the switch for centralised security control, or forward VoIP traffic directly from the access point for optimal performance. Each client connecting to the wireless network goes through a strict authentication process to ensure maximum security. Whether the client is an assigned user, a visiting guest, or a client with only departmental access, the switch protects the entire network infrastructure with numerous security mechanisms. These mechanisms include WEP data encryption, 802.1X user authentication, 802.11i standard WPA/WPA2 security, Captive Portal, and MAC Authentication. The switches provide a means to define and detect rogue APs to prevent illegal intrusion into the internal network. It provides user-based services such as virtual private group (SSID) membership, encryption type, authentication, and associated network statistics. Authorisations stay with users wherever they roam because all deployed DWS-3024/3024L switches share stored information, ensuring secure access and connectivity to the right services. In addition to checking the identity of a connecting user from the switch’s local database, user authentication policies can be sent to an external RADIUS server for complete verification. 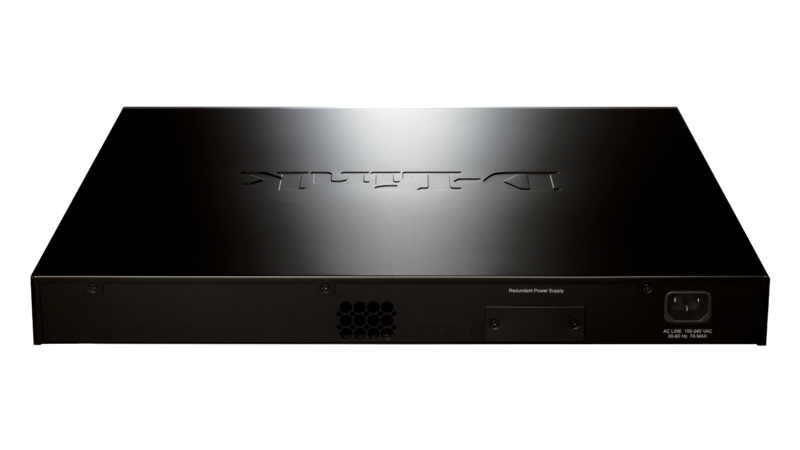 This offloading capability ensures that the switch will not be overloaded when numerous clients simultaneously connect to the network. In addition to acting as the controller unit in a wireless switching system, the DWS-3024/3024L switches can also function as advanced L2+ wired switches. Complete with packet routing, ACL security features, multi-layer QoS, 802.1q VLAN traffic segmentation, IGMP snooping for IP multicast streams, 802.3ad redundant load-sharing Gigabit links, the switches allow businesses to totally integrate their enterprise wireless networks with their wired network infrastructure.Businesses contemplating upgrading their current 10/100Mbps desktop connections to Gigabit capability can deploy the DWS-3024/3024L to take advantage of their ability to flexibly act as a wireless controller, a dedicated, full-featured multi-layer LAN switch or as a dual-role device.